I'm making Palm Trees. I'm cutting paper. Our Friends, Andy & KC… They gave up their Saturday night a few weeks back to spend 6 hours of non-stop crafting time to assemble what turned out to be our perfect invitations. We could not have done it with out them. Thanks guys! There are many wonderful Hawaiian artists, and just listening to their music will get you into the ‘Aloha Spirit’. It is likely that you are familiar with the song, “Over the Rainbow”. Take a moment to listen, and learn a little bit about our favorite island artist. In 1959, three months before the Hawaiian Islands would become America’s 50th state, “IZ” was born in Honolulu. An almost pure Hawaiian of unusual lineage, he could trace his ancestral roots to the so-called “forbidden” island of Ni’ihau. IZ became the beloved voice of Hawaii. His heart and spirit, as well as his words and his high, clear voice touched the soul of all who listened. Featuring “Over The Rainbow”, it is the first album of Hawaiian music, by any Hawaiian artist, or group, to be certified Platinum — selling more than one million copies. 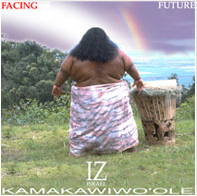 Blending Hawaiian traditional with bits of IZ’s contemporary view of Island music, it further established IZ as the most beloved artist of Hawaii. Songs included Kamalani, Kaleohano, Ulili E, plus IZ’s version of Wind Beneath My Wings. 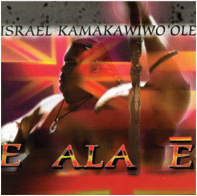 The title song, E Ala E, became the anthem of solidarity among the Hawaiian people. 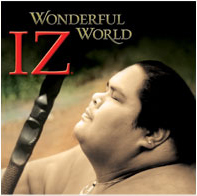 Prior to it’s release, IZ was honored in Billboard Magazine as one of the best World Music Artists. The album entered the Billboard World Chart and became a regular fan favorite, expanding IZ’s fan base worldwide. 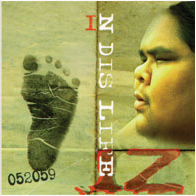 With this album, Jon de Mello had unknowingly recorded IZ’s last studio recording. The CD captures the magic IZ brought to a live performance. There was a ‘Hawaiian Rainbow Connection’ that seemed blessed and spiritual between IZ and his audience. 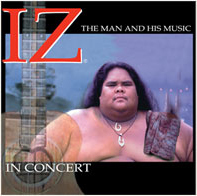 His music, mixed in with IZ’isms, embraced the entire arena with the joy he felt when performing for a live audience. A collection of musical segments drawn from hundreds of hours of rehearsal tapes, as well as incomplete and unreleased recording sessions. Compiled and produced by Jon de Mello (IZ’s only solo artist producer / the architect of his solo career) it debuted at #1 on the Billboard World Music Chart, and remained on the chart for years. As the 10th anniversary of his passing approached, Jon de Mello focused on IZ’s constant wish to someday record with a full orchestra. Jon recorded full orchestral backgrounds and mixed them with IZ’s archived, original Voice and Ukulele tracks. Debuting at #1 on Billboard, the CD remained in the top 5 slots for 2 years. Beset with respiratory, heart and other medical problems, the 700lb “Brudda Iz” died at age 38 on June 26, 1997. All Hawaii mourned, and more than 10,000 people turned out for a state funeral. His ashes were scattered into the Pacific at Mākua Beach with 1,000’s in attendance. The events were featured in this official video of “Over the Rainbow” released posthumously. The video as featured on YouTube has over 72 million views.